Custom home on 1.56 acres. Light & bright open floor plan features 2, 838 sq.ft., 4 bedrooms & 2-1/2 baths. Gorgeous beamed ceilings in the Great Room with Kiva fireplace. The hallway is picture perfect with tongue and groove ceiling & skylights for lots of natural light. Gourmet kitchen features custom maple cabinetry, Corian counter tops, large island & pantry. Luxurious Master Suite with walk-in closet & Bath with separate shower & garden tub for relaxing. Wood floors throughout. 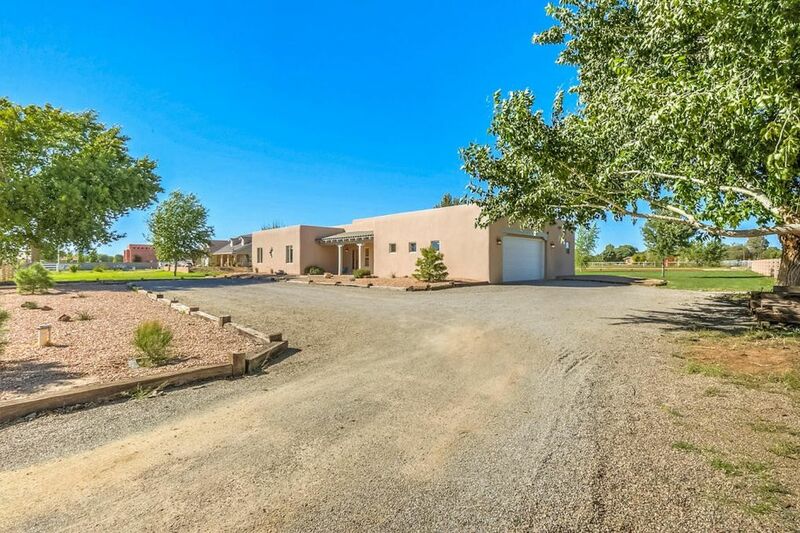 Lavish backyard w/sprawling grass, irrigation rights & is perfect for your horses. Large patio is great for entertaining. Natural gas & 2 units heating/refrigerated air conditioning will keep you comfortable all year around. Great location with easy access to Albuquerque & close to all City conveniences!